Hi there! I am Mirchita, and I am mexican, I would love to share a little bit of the much of crafting culture of my country, and I would also love to know other mexican craftsters too! ...and rise your hand if you love México as me!!! I'm half Mexican and I love bright colored Mexican crafts! Especially worry dolls. I'm founding White Girls for the Love of Latin Art as of right now! I'm American, of Italian descent, and I have to say that growing up in Southern California and volunteering at the Museum of Latin American Art, I'd just like to say that Latin American art rocks my socks off! Rivera, Botero, it just doesn't get better. It reminds me of the art I'd see in my grandfather's home, stuff from our old country. The bright colors, the curvy yet angular styles, it's just wonderful. And, don't tell my family, I like latino art better. 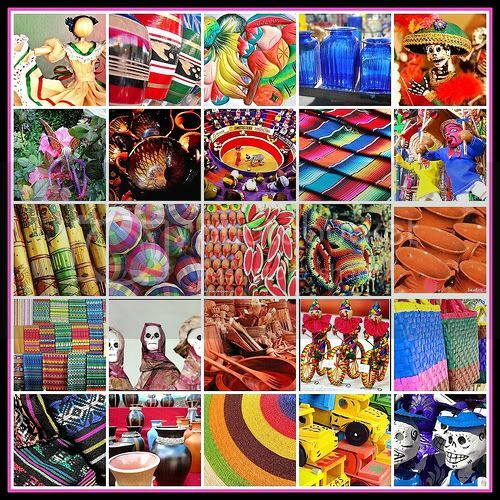 Mexican crafting culture, with rich inlaid woods, frescos, fabric weaving, Mexico knows how to get things done. You should be proud of your culture, it's a beautiful one. Dios te bendiga! I'm a proud mexican lover! My man (we've been together for 11 years!) is mexican. Some of my favorite things are loteria, Dia De Los Muertos, and the food!!! Hi Mirchita! I swear I'm not a stalker I'm from Mexico, I live in Estado de México but I have a full time job in DF, at one of the most important museums of the city. On Saturdays I work at a beauty salon. I wish I have more time for crafting. By the way, I love the pic you post, so colorful! I am from Mexico toooo!! yeyy how exciting to find this post. Even though there is only about three of us... I am from Estado de Mexico too but I am close to DF, and I am not a stalker either, jajaja, nice to know about you guys!! Hi EllynGrey!, I live in San Cristóbal Ecatepec, so is also close to DF, I hope more craftsters lives around for a meeting! hi! one more Mexican over here, I live in Reynosa, right across the border from Texas, the typical culture is kind of lost over here but i still appreciate it very much! nice meeting you! then I will fake blindness. I am not from Mexico (but I am from California!) I love the little collage you put up there! Me encantan los colores! I am taking spanish class but I feel overwhelmed and in over my head (I am just beginning the second year). I really want to learn though, (Tengo muchas ganas de aprender!) and think that if I could talk about crafts in espanol it would go a long way toward helping me. I am always checking craftster when I shold be studying - I can't help myself. Is there a spanish language crafting forum anywhere that I could sign up for, something similar to craftster?